This month I’ve been almost exclusively shooting film. That’s not completely true as I started January with my Fuji x100t as I came back from my travels and took it off to Wroclaw. However, while I was in Wroclaw I noticed that the EVF was a bit…strange. 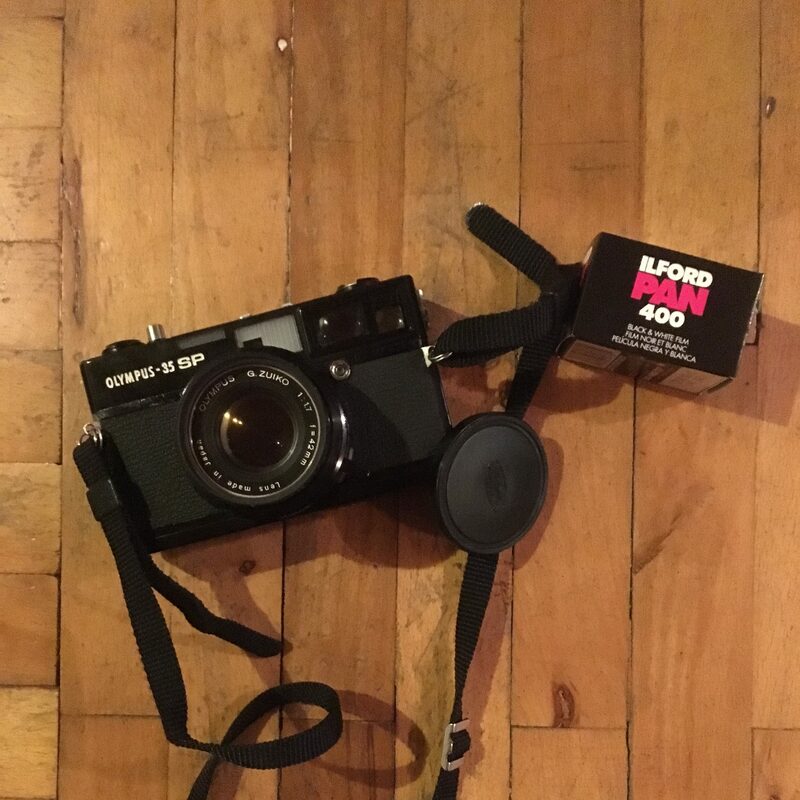 When I added the fact that the batteries weren’t lasting as long, a friend asked me a couple of questions about film, and I had half a roll of tri-x left in my Olympus. I decided to finish it off and shoot some more film. I had even considered doing a “1 year, 1 camera, 1 lens” type challenge issued by Christian Nilsson. The long and the short of it was I started shooting film on the 7 of Jan and with the exception of a couple of portraits and a friends wedding, I’ve only shot film. It’s been an interesting experience and I have a lot of unfinished thoughts which build on my previous thoughts on film. The thing with film is you can’t be certain of what is going to come back. My camera has a bit of a light leak at moments. I thought about getting it repaired but on second thought I suspect it could be used for some interesting creative effects (especially with colour film) the only issue is, it’s so hard to know exactly what will cause that issue. On the other hand, getting a roll of film back brings surprises of images you forgot about or how the end result turned out. Perhaps this is exaggerated by black and white film which focuses on textures and the exposure can have a huge impact. The Olympus SP 35 is a fun camera but not without faults. It requires manual setting (although there is an aperture priority mode which I never use), it has a very simple focusing ring which isn’t great when objects move beyond five meters or are closer than a meter. The 42mm focal length is fine and the lens is very sharp. But I lost a couple of frames recently when I accidentally set the self timer. It turns out that if you set the self timer and progress the film before the timer finishes, the timer will run next time as well. Urgh. Still, having a mechanical camera which will work with or without a battery in (it’s only for the light meter and aperture priority mode) is a lot of fun. Sure, you have to load the film but that’s that. One of the things I’ve been thinking about film is how good it is to have something physical which lasts. In 20 years time it’s unclear if computers will still read my image files. Maybe they will, maybe not. But we’ll be able to scan these films again and create new copies (Or print them via a darkroom). On the other hand, there will probably be file conversion tools online, using Adobe editing tools will probably make sure the life of those files and with online backup I never need to worry about a fire destroying the only copy of an image. And that’s not even mentioning the fact that digital files take up much less space. Perhaps using both is the best solution but I don’t know. One of the points I remember reading from Charlie Kirk was that when you shoot digital you “edit” and when you shot film you are “photographing”. Okay, this is an over exaggeration but there is an element of truth behind it. When I have a digital camera, I’ll sit at a street corner and shoot every person who walks past (pretty much). I’ll keep the camera to my eye and just notice when something enters the frame. But when I shoot film I can’t waste that many shots, so I have to keep my eyes back from the viewfinder and more aware of what is around me. I often frame a shot with the background and then look up and down the street. It’s a far better way of shooting and I’ve started to do it when I shoot digitally as well as the influence of film bleeds over. This is just one example and I’m not saying that you have to shoot film to learn this skill, but those creative constraints help. If you’ve never shot film, it’s probably worth trying film for a bit just to see how it impacts your shots. With my Olympus SP 35 I don’t have to turn a power dial to turn it on. Instead, once I’ve wound the film on, it’s ready to go. I never have to think about my battery slowly running out of power or it going into power saving mode leading to a delay in starting up. When I shoot film, I can forget about all that, I know it’s ready to go when I click shoot. Ironically, I like the idea that there is a limit to the shots you can get. When it get’s too dark, I know that there’s no point in me trying to take photos. Or when I finish a roll and I have no more rolls on me, I know that is it for the day. Finally, when I see a great colour scene but all I have is black and white film in my camera…Well that’s that then. It is kind of reassuring and calming that I can’t really explain. Ultimately, this is the reason I keep coming back to as to why it’s not worth shooting film. I don’t mind the delay in processing but the continual cost of film is a pain. I worked out I could get a decent SD card for the same price as getting one roll of film proceed. That’s a huge price different. As someone who doesn’t earn a huge salary, that’s a significant factor. In addition, I am drawn to minimalist ideas (though I don’t often live those ideas out) and using money responsibly fits in with most minimalist philosophies (but not always). Saving money by not shooting film can be used to save, help others or reduce debt. I’ve only shot a few rolls of film so far but storing the negatives has gone from “cool a roll of film” to “erm…where am I going to put these”. One thing my wife pointed out was that I could put my developed rolls back in the tubes that rolls of film come in (the camera shops here don’t cut up film into strips). I guess this is the other side of having the physical thing that will last…you’re going to have to put it somewhere! What about Quantity over quality? I recently wrote about how you should focus on quantity over quality as studies have shown that it leads to more quality in the long term (basically you practice and experiment more when you focus on quantity). If ever there was a case for digital, that’s it. When you shoot digital, you can just keep shooting and not reload or worry about how many rolls you’ve got. In my opinion, this is the biggest argument against film. If I had to choose one argument over all to choose digital, I’d go with this one. When I really try to consider which I should shoot with, film or digital, I end up coming back the conclusion that with film, the process is its selling point. The slower pace, surprises and “Zen like” experience makes it more compelling and “better” (you need a quick turn around for a publication or event, then it isn’t). Of course, there is also the benefit of the lower entry price as well. But with digital, the lower on going costs and especially, the ability to experiment make it a very compelling tool to use. Overall, I think I want to use both. I know that I’ve taken shots and experimented in ways I wouldn’t have because I’ve used a digital camera, but the process of film is also really rewarding. So I straddle both the film and digital proponents. I suspect that I’ll end up shooting mostly digital after this month ends and my film experiment official ends as I really love the Fuji x100t but I may surprise myself still. Anyway, I’ve spent too long mulling this over, it’s much better to just get out and shoot. OK, I’m jealous, you got a BLACK 35SP! Please do me a favour and get some light seal material for the cameras – too bad to have light seals on such a wonderful machine. You’re no Lomographer after all! Film lasts? sure, if you keep it well and if you don’t decide as I did on the spur of the moment 15 years back then I’ll never again use film and ditched my slides and negatives. I still could cry if I think about that. As for space, I have 3 years of negatives in a slim backed binder, safely stored in negative sleeves. Not much space lost! 1) Do I want that shot? 3) Do I REALLY want that shot. Normally these decisions are make in the bling of an eye. If I need more time it’s because I don’t want the shot and I pass on. As for quantity vs quality, it precisely the quantity of digital that made me go back to digital. Tired of shooting lots of frames and sifting thorough the crap to find a nugget. I prefer trying to just do the nuggets…. Entry price…. YESSSS, The cameras I craved in my youth are dirt cheap now! Thanks digital!!! Perhaps one day digital will get me back but for the moment it has no attraction for me. I savour those moments slowly roving through the streets or landscapes, looking for the photos hidden around me with these wonderful brass and steel things in my hand. Thanks for the thoughts and feedback Frank. I think I’m with you for the most part and I’m really intrigued by developing my own film and bulk rolling as well (saving money plus that’s where the REAL magic is at right?) I think your point about “thinking before shooting” is so valuable. It really has changed the way I walk around the street. I might have missed some shots that could have been good but I don’t think I’ve missed that many to be honest. I’m on amazon as I type looking for a nice negative binder of some sort (I’ll check in my local film shop before pulling the trigger of course). Do you use any dividers to organise your film like having a reference for month or something like that? I’d love a peak inside your system. Yeah I got a black one 😀 after getting a chrome fuji x100t and constantly thinking “I really should have got the black one” I knew better this time! I’ll take a look at the local camera repair place for the price of sealing it up. I think you’ve seen how the light leaks affect the images on my Facebook collection, a lot of the time, there’s no impact. Sometimes I lose half a frame. I don’t really get why but there you go.